The Diocese of Covington supports the efforts of Scouting as a Ministry. Badges, medals and emblems are available for those who seek to involve their Catholic faith into their scouting efforts. 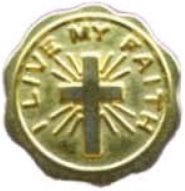 The Light of Christ emblem (grades 1-2) for Tiger Cubs and Wolf Cubs Scouts. Full requirements are available from the National Catholic Committee on Scouting. The Parvuli Dei emblem (grades 3-5) for Bear and Webelos Cub Scouts. Full requirements are available from the National Catholic Committee on Scouting . The Ad Altare Dei emblem (grades 7-12) for Boy Scouts of the Latin Rite. Full requirements are available from the National Catholic Committee on Scouting. The Pope Pius XII emblem (grade 9-college) for Boy Scouts and Explorers. Full requirements are available from the National Catholic Committee on Scouting. 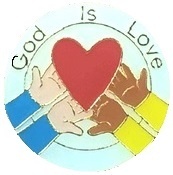 God is Love – For kindergarten and 1st graders, who are enrolled in Girl Scouts or Heritage Girls. Family of God – For ages 7-9, who are enrolled in Girl Scouts as Brownies in 2nd and 3rd grades. I Live my Faith – For girls ages 9-11. Spirit Alive – For young women in high school registered in the senior level of Girl Scouts. 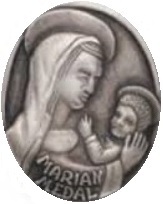 Marian Medal – For girls ages 12-15. The Catholic Committee on Scouting for the Diocese of Covington has approved the Bronze Pelican Award for service to Catholic Scouting.Please submit nominees on this form by January 31 to a member of the Catholic Committee on Scouting in the Diocese of Covington. The Saint George Award is a recognition given by the National Catholic Committee on Scouting through the local ordinary. It is presented to those adults who have made a significant contribution to the spiritual development of Catholic youth involved in the Scouting program. The Saint Elizabeth Ann Seton recognition was inaugurated in 1980 to recognize the meritorious contributions of adults who serve Catholic youth through girls’ organizations. Guidelines and nomination forms are available from the Office of Catechesis and Formation, or can be downloaded here. The Saint Anne Medal is the highest national recognition for adults who serve Catholic youth through girls’ organizations. 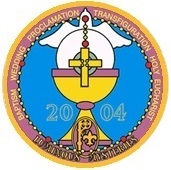 Guidelines and nomination forms are available from the Office of Catechesis and Formation. A nomination form for the St. Elizabeth Ann Seton and St. Anne Medals is available here to download. Please return completed application forms to the Diocesan Catholic Committee on Scouting at [email protected]. 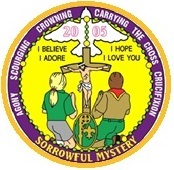 This program was developed by the National Catholic Committee on Scouting’s Activities Committee. All Scouts, Girl Scouts and Camp Fire Boys and Girls, and American Heritage Girls are eligible to earn the patch. Click on the patches below for a brochure on the individual mysteries. We encouraged our youth to learn more about their Catholic faith and rich tradition by making a pilgrimage to different parish churches in the Diocese of Covington. Participants learn about the parish’s history, art and architecture, and faith community. To receive The Trail of Churches Pilgrimage patch participants will visit seven pilgrimage parishes which consists of their own home church, the Cathedral Basilica of the Assumption, Mother of God Church, and four additional Catholic churches from the list below, and then answer a list of questions about the churches they visited. A cathedral is the Mother Church of a diocese, the parish church of the Bishop, where did the word “cathedral” come from? There is a hand carved statue of the first Native American saint is in the arch behind the altar. Who is that saint? Who is the world famous artist who created the oil paintings found in the Blessed Sacrament Chapel? 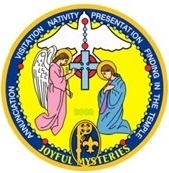 Four of the Joyful Mysteries of the Rosary are depicted in the stain glass windows in the body of the Church, on the right side as you face the altar. Which mystery is missing? Where do you find the oils used in the administration of the Sacraments? Where is the bronze statue of Mary, under the Title of Our Lady of Guadalupe, found in the Church? To what nationality of people is this statue especially meaningful? Why is she important to Americans? On the roof of the Cathedral are found gargoyles. What is their function? When a church receives the honored title of basilica two symbols of the Vatican are placed in the Church, one is the umbrella created in the Vatican colors and the other is an ornate bell. What were these used for? 1. In what year was the cornerstone laid? 2. What is the date of the feast day of Holy Cross? 3. Who was the first pastor in 1890? 4. The first mass was celebrated when? 5. What year did the first remodeling of the present church take place and how long did it take? 6. What year did a fire in the sanctuary of the church take place? 7. During the time of repairs due to the fire, where did we hold church services? 1. When did Holy Spirit begin? 2. Who painted the Stations of the Cross that hang in Holy Spirit Church? 3. How long is the center aisle in Holy Spirit Church? 4. How many people can the Holy Spirit Church accommodate? 1. What needlepoint image hangs in the gathering space? 2. Who is the statue of, located in the back of the church next to the prayer candles? 3. What is located on the lawn in front of the upper parking area? To whom is it dedicated? Who built it and why? 4. What year was the cornerstone laid? 5. What is the name of the cafeteria and to whom is it dedicated? 6. Where is the baptismal font located in the church? Who was the first pastor? When did the church first open? Who were the first teachers at the parish school? What two popular devotions are said each week? When was the church renovated? What scouting organizations does our church have? What is the school’s mascot for its teams? What diocese are we located in? What popular district high school is very close to our school? Who is the present pastor? What is our parish famous for? What convent is located across the street from the church? Who is the deacon serving the church? What famous business is near the church? There are four small individual statues on the high altar. Who do they represent? How can you tell? Locate the image of the Good Shepherd finding the Lost Sheep. Tell where it is and what material it is made from? There are five large murals painted by a famous Northern Kentucky artist and parish member, Johann Schmitt. What do they represent? The ceiling and walls are decorated with words in addition to the other designs, in what languages are the words written? Ecce Mater Tua is written above the Crucifixion statuary. What does this mean in English? The upper sections of the windows tell the story of Mary the Mother of Jesus. Find the one where she is a baby. What color garments is her mother, St. Anne, wearing? There are three former, deceased pastors buried in the church. Find their tombs and write down their names? 1. Which is the only predominately African American Catholic Church in the Diocese of Covington KY? 2. In what year did the church open? 3. For what purpose did the parish begin? 4. When and why did the school close? 5. What type of Religious art and “décor” is found in the church? 6. About how many people could attend Mass in the church? 7. Who is in the picture on the right front wall? There are four statues inside the church, one on either side of the alter, and one on either side of the main nave. Who is depicted in each of the statues? Who is featured in the first two stained glass windows on each side of the main nave (i.e. nearest the back or entrance to the church)? The round stained glass window behind the choir loft depicts a sword behind an open Bible. What words are depicted on the Bible, and what do they mean? Who was the first pastor of St. Agnes and what years did he serve the Parish? On the left side of the main nave is a small shrine to St. Agnes. The framed certificate depicts a primary relic of St. Agnes. Explain what a primary relic is. Which St. Augustine is this church named after? The statue of St. Augustine shows him holding a heart in his hand. This to remind us of what famous quote of his? Give a brief outline of this man’s life? In what year was St. Augustine church built. How did Catholics here get to Mass before the church was built? When was the parish school started and what order of Sisters staffed it? Name the pastor who was here the longest? How long was he here as pastor? What language was spoken at St. Boniface and what language was spoken at St. James when the Churches first opened? What year did the two churches merge? What is the date that a tornado destroyed St. Boniface? When was St. James Church dedicated? When was the cornerstone of the Church laid? What does the statue of St. Edward hold in his hand? Name the three sacraments that are depicted in the largest stained glass window? How many statues are present in the Church? How many people can be seated in the pews? What statues are in the back of the church? Who are the saints in the stained glass windows? There is a statue to the left of the Altar. Who is it? There is a statue to the right of the Altar. Who is it? What does the plaque say that is located in the front of the Parish Center? Who was the first appointed pastor of St. Johns the Evangelist? What is the date the cornerstone was laid for the second St. John church? Who is the baptismal font in memory of? When was the cornerstone of St. Joseph Church laid? St. Joseph, Camp Springs is the “mother church” of four churches. Name the four “daughter churches”? When and why was the Grotto of Our Lady built on the Parish grounds? Is there and image of the patron of our Church within the Church building? Where? Name the artist who created the paintings in the sanctuary? How old is Saint Joseph Elementary School this year (2015)? An addition was built on to St. Joe’s connecting the main nave and chapel. In what year was it done? The statue of St. Jude inside the church depicts him with what on his head? Where is the Parish Book of Remembrance? A stained glass window at the entrance of the center nave was donated by whom? What is the name of the St. Joseph’s parishioner killed in the Iraq War? What year was the original church built? What part of the original church still stands today? How many stained glass windows are in the church? What is located to the left of the church from the parking lot entrance? To the left of the door facing Sparta Pike near the sidewalk there is a marker, what does it stand for? Where is the rope located at to ring the church bell before church? Who are the wooden statues of inside the church? Where is the confessional located? What statue is located in the flower garden? What hangs on the white section of the wall behind the altar? Where are the Stations of the Cross located? Where is the Lord’s Prayer displayed? Name the tall concrete statue standing between the front doors of the Church? In the back of the Church close to the Reconciliation Room there is a stained glass window. Who donated the window? In the Church Sanctuary directly in the center in front of the altar there is a diamond shaped design in the floor. In the design there is a cross and some Greek letters. What of the Greek letters mean? In the sanctuary besides the Main Altar in the center there are two Side Altars. To who are they dedicated? In the Sanctuary there is a Communion rail. It has symbols in the form of a Cross with a circle around its center and two Greek letters the look like our “P” and “X”. Together what do these letters mean to believers? In front of the church there is a place called the Mall Meditation Garden. Besides the Rosary Walk in the bricks surrounding the Cross of Bricks in the center there is another series of plaques on the stone walls. What are these plaques? In the front of the church, in the Mall Meditation Garden there are two statues. What are the titles or description of these two statues? In the school building there are two sections called the Schneider Building and the Carlin Center. Why were these names used for each of these sections of the school building? What year did Sts. Peter & Paul begin? What year was the cornerstone laid? The podium in the Church is handmade and donated by Charlie Rust. Who is it in memory of? Who is the Pieta Statue donated in memory of? Who designed and painted the Church banner? St. Pius X Parish started out with another name and in a nearby location. What was the original name of the parish? What is the significance of the large crucifix above and behind the altar? The statue of Mary in the chapel area is based on what famous statue? The baptismal font is in the shape of what familiar symbol? Locate the statue of our patron, St. Pius X. Where is it located? The tabernacle at St. Pius X is unique and ornate. What figure is on top of it? The Stations of the Cross were recently added to the church. What art form are they? In what year was the cornerstone laid? How many saints are there in the apse? How many times is St. Thomas portrayed in the right transept window? What saints have symbols on the outside façade of the church? Where in the church is there an image of the church? What birds are found in the sanctuary? To whom and when was the Church hall dedicated? Name the artist who painted the painting of St. Timothy located in the Church. What verse appears on the painting? Which Bishop dedicated the Parish Center? When was the groundbreaking for the Church? Who is the statue of that is outside? Where is the chapel located? You can download a list of the churches with their questions here. For additional information call Rick Hayden, 859-372-0300, or email, [email protected]. 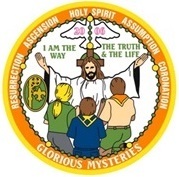 Youth do not have to be involved in Scouting to participate in this pilgrimage and receive the patch. This is a great opportunity for parents and children to make this pilgrimage together as a family. The Religious Emblems Counselor Application Forms are now available online. 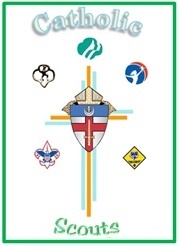 Please return completed application forms to the Diocesan Catholic Committee on Scouting at [email protected].